3.1. 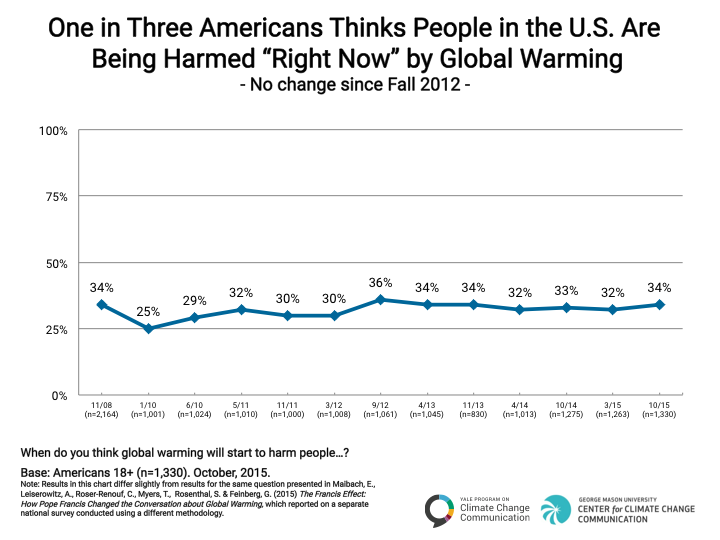 One in Three Americans Thinks People in the U.S. Are Currently Being Harmed By Global Warming. The impacts of global warming are starting to be felt in the United States. According to the 2014 U.S. National Climate Assessment:http://nca2014.globalchange.gov/downloads “Residents of some coastal cities see their streets flood more regularly during storms and high tides. Inland cities near large rivers also experience more flooding, especially in the Midwest and Northeast. Insurance rates are rising in some vulnerable locations, and insurance is no longer available in others. Hotter and drier weather and earlier snow melt mean that wildfires in the West start earlier in the spring, last later into the fall, and burn more acreage. In Arctic Alaska, the summer sea ice that once protected the coasts has receded, and autumn storms now cause more erosion, threatening many communities with relocation” (p. 1). Yet only about one in three Americans (34%) thinks people in the U.S. are being harmed “right now” by global warming, a number that has remained steady over the past several years. 3.2. Most Americans Think Global Warming Is a Relatively Distant Threat. 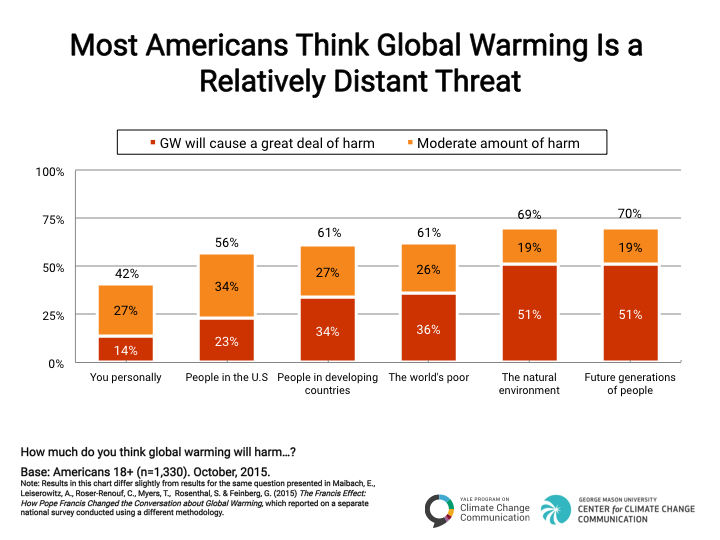 Americans are more likely to think that future generations of people (70%) will be harmed a “great deal” or a “moderate amount” by global warming than will people living in developing countries (61%), or the U.S. (56%). They are least likely to think that they themselves (42%) will be harmed. 3.3. 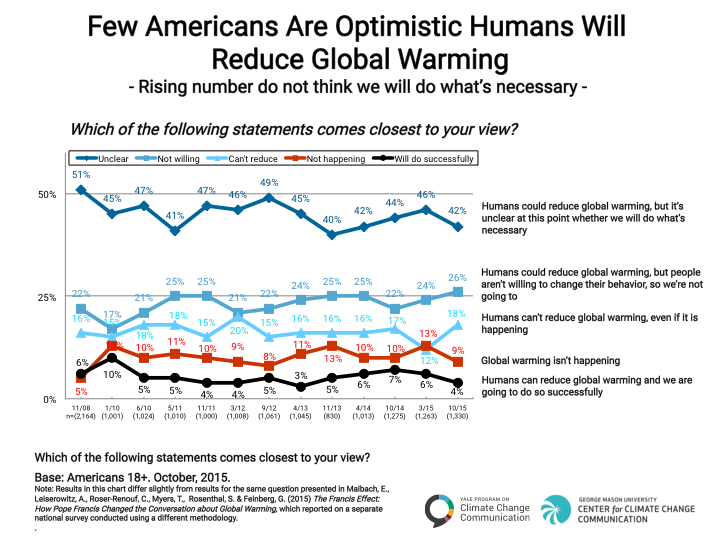 Few Americans Are Optimistic Humans Will Reduce Global Warming. About four in ten Americans (42%, -7 percentage points since fall 2012) say humans could reduce global warming, but it’s unclear at this point whether we will do what is necessary. This decline signals a growing lack of optimism that people will successfully address climate change. Whereas only 4% say humans can and will successfully reduce global warming, about one in four (26%) says we won’t because people are unwilling to change their behavior, and about one in five (18%, +6 points since spring 2015) says humans can’t reduce global warming even if it is happening.